The .22-Calibre Long Rifle Cartridge in a Stevens Rifle. Volume 5, No. 15, published February 7, 1889. A few months ago a very careful and complete test was made with the .22-calibre, short rim-fire cartridges. The results made public are believed to correctly show the work one could expect from those cartridges, and the writer and others have seen no average work since the publication of the reports, to indicate that that cartridge, as now manufactured, is capable of better average work. After finishing the test it was decided to take the proper time to make an equally thorough test, with the .22 long rifle cartridges, and in order that a comparison might be made with the work of the short cartridges, the shooting was done at the same distance, viz., 40 yards. It should be stated that nothing but the accuracy of the cartridges was sought for. The telescope sight was not used, as was the case when testing the short cartridges. The shooting was done with two Stevens rifles. The first had a barrel 28 inches in length, which was quite heavy; it was fitted with a rear peep and front wind gauge and aperture sight. The second rifle was a Hunter’s pet model Stevens rifle, which had a heavy barrel, 20 inches in length, with rear peep and front fixed aperture sight. A match was announced by the proprietor of the Massachusetts Rifle Gallery at Boston, and several expert rest shots have for the past few weeks been in lively competition, which presented a fine opportunity to note the work done with the .22 long rifle cartridge in the hands of different acknowledged experts. The ammunition was made by the Union Metallic Cartridge Co. It is the unanimous opinion of every rifleman who has shot the long rifle cartridge, that it is certainly the most accurate rim-fire .22-calibre cartridge which has yet been produced. The charge of powder in this cartridge is five grains of powder and a bullet weighing 40 grains. The charge is well proportioned, which contributes much to the accuracy. There is also another point which makes the bullet a true flyer, which is it is uncrimped in the shell. The writer witnessed some very fine shooting done with the ordinary short cartridges when uncrimped, and feels this is a very important factor towards making this cartridge an unusually accurate one, but while it contributes to the accuracy, it is to a certain extent objectionable, as it forbids the removal of the cartridge from the chamber of the rifle without leaving the bullet in the rifle. This causes the powder to spill from the shell and prevents the use of the cartridge in a repeater. 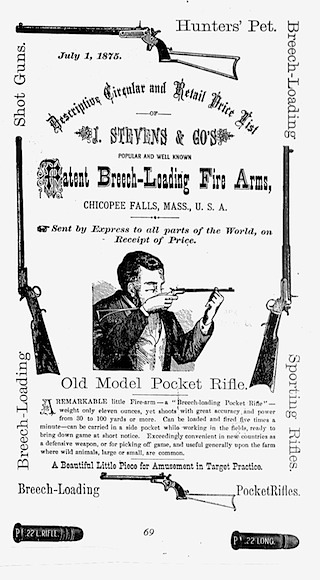 Besides this, in the case of a mis-fire the rifleman is in something of a predicament, which would be especially so if he were hunting, for if he removes the cartridge, as a rule, the bullet remains in the breech of the rifle, and the only alternatives are to turn the shell and snap the piece again, and if unsuccessful in procuring a discharge a rod must be secured, and the bullet pushed out of the rifle barrel. As few sportsmen would carry a rod when hunting, this is quite an objection to the cartridge. If the shell fails to discharge after repeated attempts, one may resort to inserting a fresh cartridge, forcing the first bullet forward and firing the two bullets. It will be seen that the non-crimping of the shell is likely to cause not a little trouble, but if crimped it interferes with the accuracy, so at the present time it is the study of the manufacturers to make the bullets fit as tightly as possible in the mouth of the shell without crimping, and the rifle manufacturers free the breech just in front of the chamber to endeavor to overcome this trouble. They have partially succeeded in overcoming it. But as the increased accuracy of the long rifle cartridge over the .22 short cartridges is so apparent to all who have used them, riflemen seem inclined to accept it with this fault. 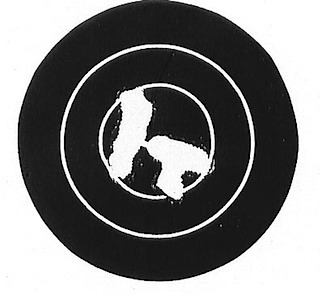 The targets made at the time of this writing are superior to those made with the short cartridge. A score of ten shots, aggregating, in count, 97 points, usually was considered a good one with the short cartridge, and 98 points about the best. These aggregates are very frequently made with the long rifle cartridge, and the participants in the match do not seem to consider a score counting less than 98, of any particular merit, or likely to count in the match. A careful comparison of a series of 50 and 100 consecutive shots show that the long rifle cartridge is considerably more accurate than the short cartridge. To just what extent the long rifle cartridge is the superior to the short cartridge in point of accuracy, is difficult to say, but there exists an opinion among riflemen that where the short cartridge can generally be relied on to make from 90 to 95, at 40 or 50 yards, on the Standard target, the long rifle cartridge could generally be relied on to make from 95 to 100. The long rifle cartridge apparently bunches the shots much closer together, on average, than the short cartridge, and, where great accuracy is the chief object, it looks as though the rifleman would not be willing to go back to the short cartridge. In the course of the shooting it was noticed how the shots would bunch together; this is well illustrated in target No. 1, shown at right, which represents five consecutive shots at 40 yards. It would be absurd to offer this target as average shooting, although many times bunches of two or three consecutive shots would break into the same hole, and with more frequency than with the short cartridge. This is so apparent to contestants in the matches mentioned that they unhesitatingly select the long rifle cartridge; and so general has become the belief among the majority of patrons of gallery shooting that the long rifle cartridge is superior to the ordinary short, that it is a rare thing for any one to use the latter in rest shooting. At the gallery, where the shooting herein described was done, the rifles which were the favorites a few months ago are now seldom used for rest shooting, and the call from the experts is almost wholly for the Stevens rifles, made with the quick twist, and the long rifle cartridge. It has previously been shown that a number of shots can be kept in the 8-inch bull’s-eye, at a distance of 200 yards, with this rifle and cartridge. The sportsman should remember that this fact is mentioned only as evidence of the accuracy of the cartridge, and not as an endorsement of its being the best one for small game or target practice, but in the future I have no doubt the sportmen’s papers will contain many accounts of game killed at 200 yards with this tiny cartridge. But while chronicling the merits of the .22 long rifle cartridge, it is apparent that defects exist, the “key holes,” which come with all factory ammunition, especially with the .22-calibre cartridges, occasionally appear with these new cartridges. 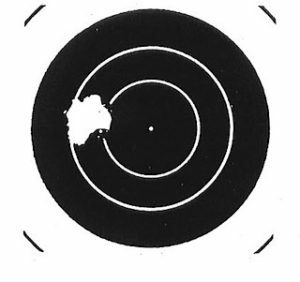 A perfect score of 100 has been made in ten shots, and a few shots later a wild one would come, and the bullet go through the target sideways, supposed to be caused by the base of the bullet being smaller than the rest of it; the next shot would go back into the ten circle. These wild shots come with all makes of .22 calibre rim cartridges, but with perhaps less frequency in the .22 long rifle than in the short. Miss-fires occur at times, which is supposed to be caused by the non-crimping of the shells, as when the cartridges are exposed to heat the lubricant will work down inside the cartridge to the priming and kill it.